I was so excited to get these photos from Bonnie Sue. 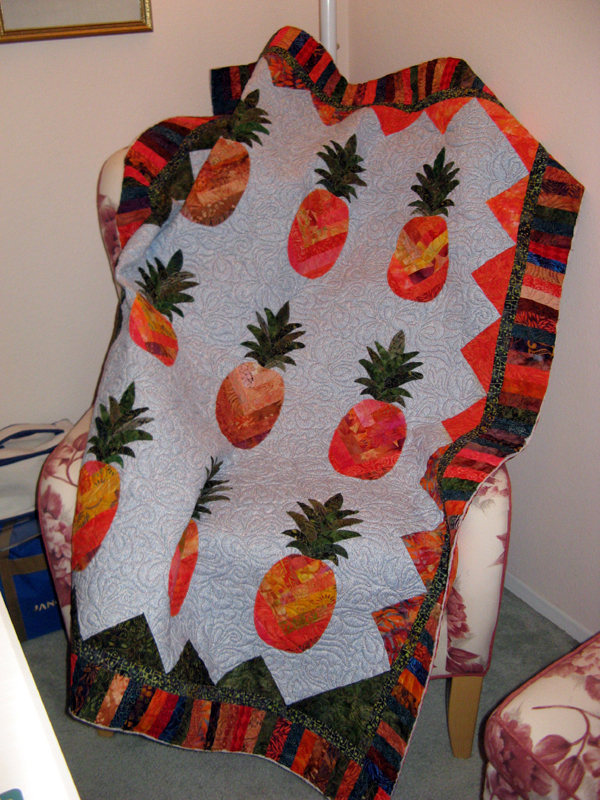 She's the first to complete her Crabapple quilt project from the swap just finished the end of June. 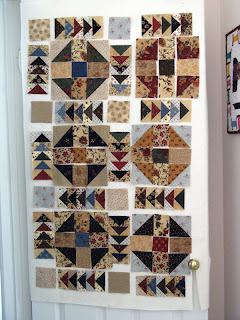 Love the yellowgreen fabric she used for the setting triangles. This is a Bonnie Hunter design from her book Adventures with Leaders and Enders. I'm sure to post more as the group of 18 finish their projects. Here's Kaktus that will fit on my design door so far. I've got lots of other pieces done but no room to show you! 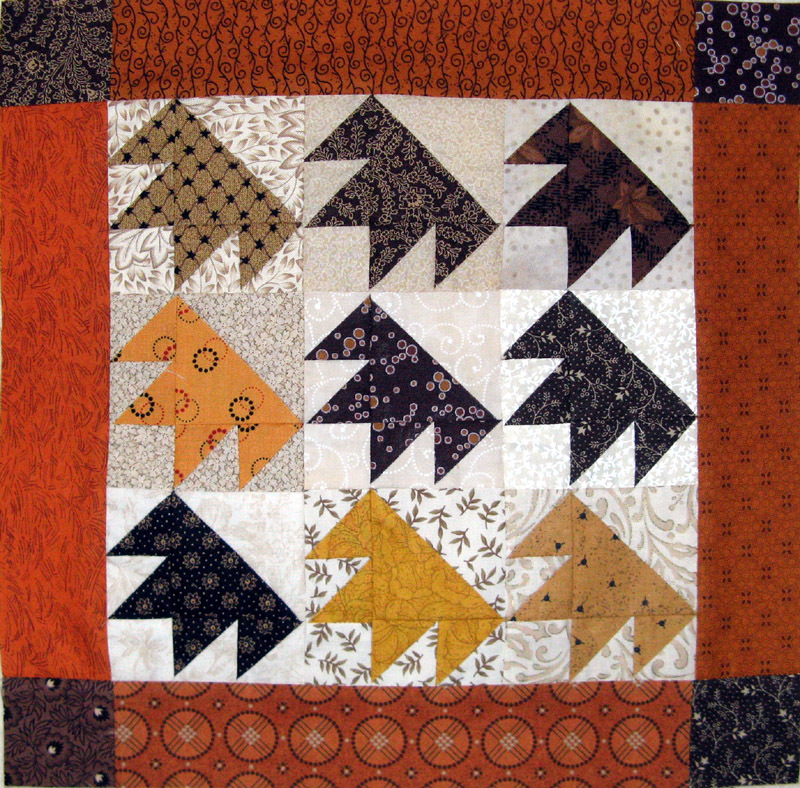 I still have lots of geese to finish and a few more of the HSTs. My fabrics are holding up for now. The pile of paper patterns for geese looks daunting still. I'm hopeful that I've got enough to finish this project. It sure is a good thing I've got it this far along. All other July deadlines are done! Any wagers that Judy will call for #6 in August? I've had a bit a a tough week. I have been nursing a very sore hip, thigh, and knee for the past two weeks. I finally went to my doctor's office on Monday for muscle relaxers and pain medication. I so hoped that the pain would just go away, but not this time. Apparently my sciatic nerve is inflamed which is causing a very tight muscle. Doctor's orders were lots of rest through Thursday when you may be okay to return to work...(great). Wednesday evening after restful days with lots of ice and fitful nights with little sleep a Thursday return to work seemed the furthest from being a possibility. Thursday I reached the same reality for a Friday return to work. Besides working four hours from home no other work for the entire week. This weekend has been more resting because Monday I've got to get back to work. What's been hardest is to have nothing to do. Gosh I couldn't even sit up long enough until Friday for even sewing...which is of course my gauge to see if I'm okay to go back to work. If I can't sew...I'm certainly not ready to sit for nine hours at my desk not to mention no pain medication that entire time which can cause one to be drowsy. I'm willing myself every minute today that I will get to work tomorrow! 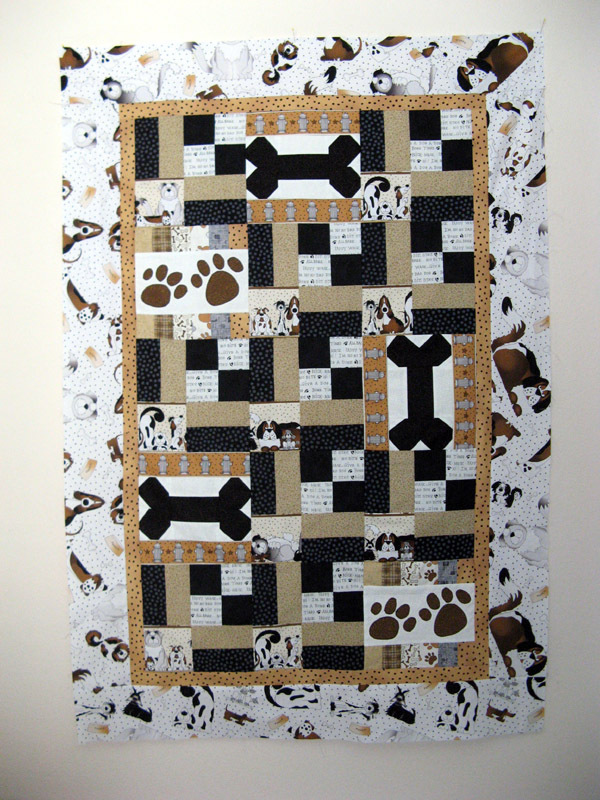 So Friday I spent time getting the top done on the San Diego Humane Society's 26th Fur Ball "Pawradise" quilt donation together. The blocks were jointly made by Kerry and I so we will both claim half the yardage as used. Kerry will get it quilted and the binding sewn on by Wednesday when it comes back to me for the hand sewing of binding and label. The event is just around the corner and we won't let the pets down! Here's my report for this last Sunday in July 2012! Finish! 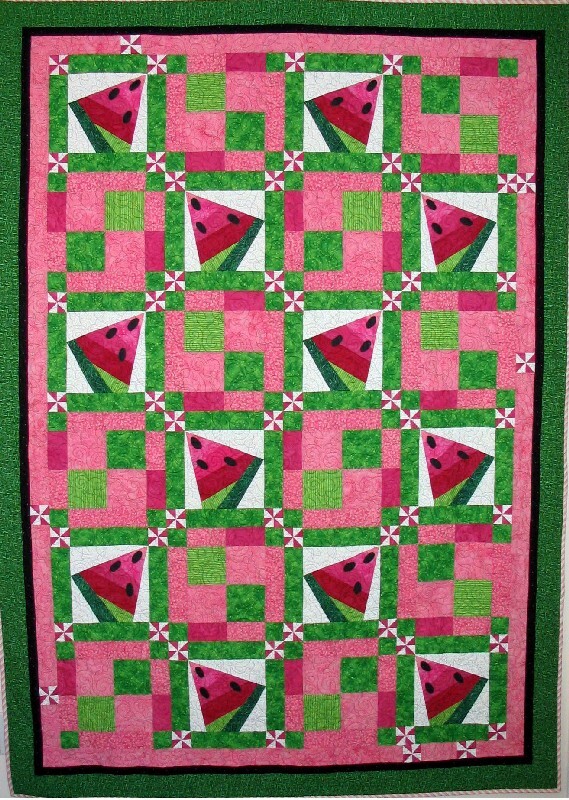 Jo's Country Junction is having a Quilt Along through 2012 with Lori Smith's Quilt Squares patterns. 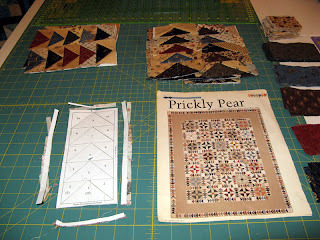 We've used Quilt Squares #1 for the first four blocks and Quilt Squares #4 for the second four blocks. Jo let us know that for August we'd have our choice of which design to make. I chose the Double T block. I think I brought in an entirely different design and enough of the brown and cheddar that I started with in January (Log Cabin) and February (Bear Paw). So I'm ahead for August. 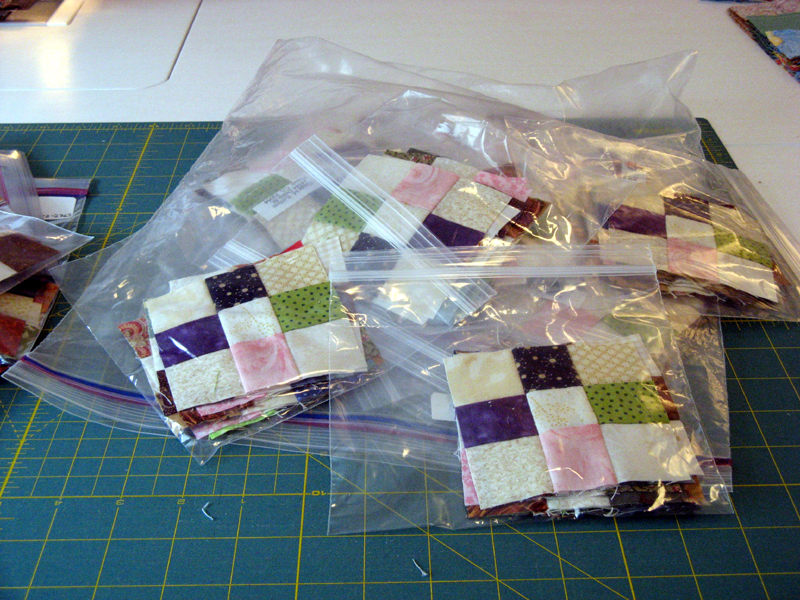 Ready for the next Quilt Squares #6 and the last four blocks! Jo's Quilt Along blocks through August. I found myself somehow on Saturday at Country Loft in La Mesa. Well I honestly didn't just stumble in...I learned they were celebrating their 27th anniversary with a 27% off everything in the shop sale! 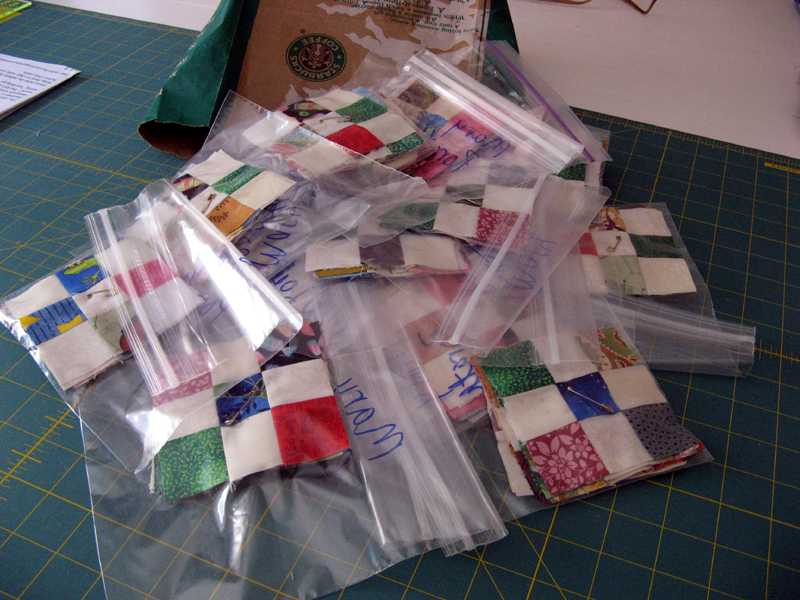 The shop was filled with quilters taking advantage of their discount. I was on the hunt for Kansas Troubles fabrics. I wasn't disappointed. 6 1/2 yards found it's way to my home. All of these have a current need with Kaktus (aka Prickly Pear) that is right now on my sewing table. The fabric on the left will be for the border and the two stacks dark and neutral will be for the HST blocks and a few of the flying geese units that still need to be made. This has been a fun project for me. Paper piecing the flying geese. I'll have more to report on them tomorrow so check back. Finish! 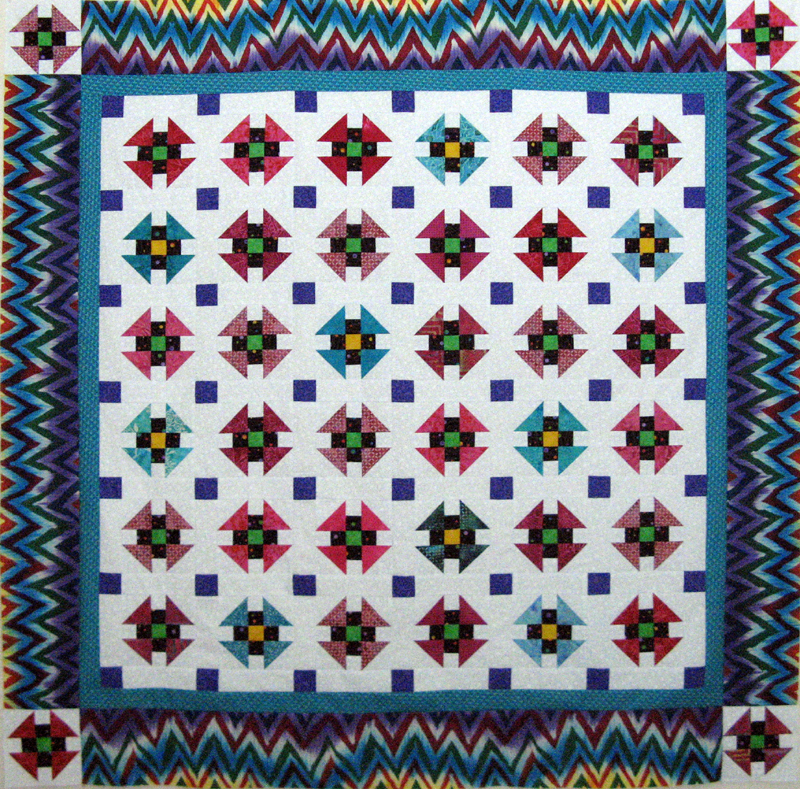 This single star block is my July challenge block for the Quilt Along that's going on with Jo's Country Junction. 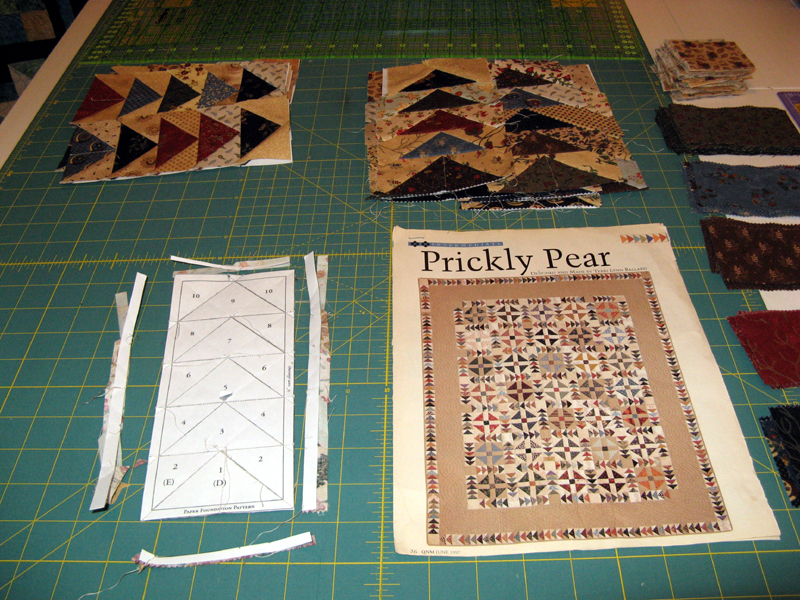 This month we were to select one of the two star patterns from Lori Smith's Quilt Squares #4 pattern. I decided to make the single star since I have a block already with multiple stars from Lori Smith's Quilt Squares #1 pattern which was finished in March. I really like the multiple colors but needed to bring in more of the cheddar that I started off with in January and February. Jo's already made it known that August's challenge will be "your choice". The Double T block is already started! 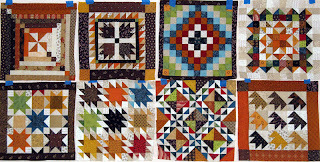 Janet sent me several Kansas Troubles strips to help me with variety in my Kaktus project. Thank you so much! The cheddar and purples weren't part of what I had. Terrific! I also did take advantage of Country Loft's 27% discount today only. I picked up the rest of the fabrics I think I'll need to finish. Pictures of my 6.5 yards which are mostly all Kansas Troubles will be on tomorrow's post with my weekly Stash Report. Finished during my lunch break! Looks like I have a series of "No!" 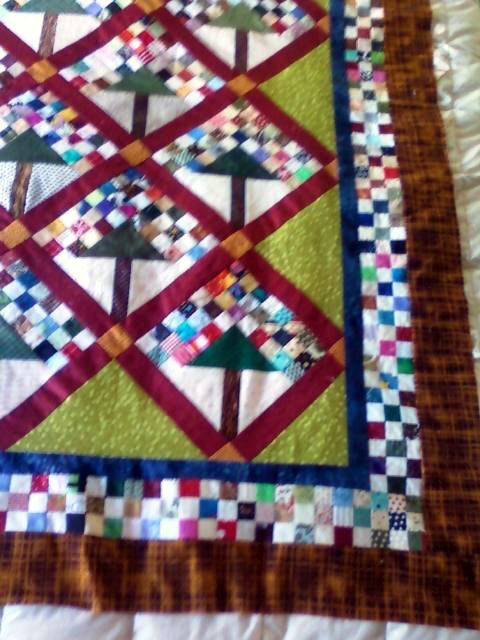 quilts going. Kokonut No! is the second one; the first was Kantalope No! I'll be going on Saturday to take advantage of a great sale at Country Loft in La Mesa. 27% discount that day to celebrate their 27th Anniversary. I know they have a good selection of Kansas Troubles...I'm in need of some variety to finish my Kaktus project. Also, I can't wait to get the swap Janet O and I have arranged. 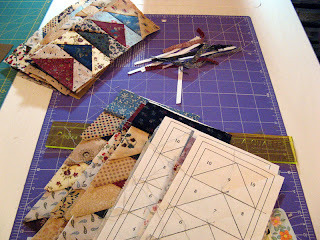 I'll be getting a bunch of Kansas Troubles strips and in return I'm sending batik bonus triangles and strip pieces. We are both going to be happy in a few days. Labels: 2012 UFO, Kaktus, Kantalope No!, Kokonut No! If you were visiting me yesterday I suppose you'd think there hasn't been much progress on Pawradise. 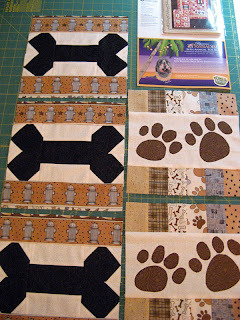 Well then you would be wrong...as I'm all done with the paw prints and putting the strips on the top and bottom of the two blocks. I'm ready for you Kerry! 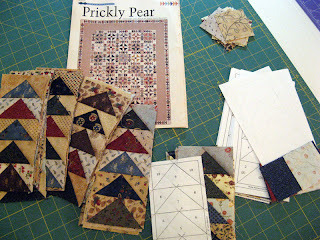 There are other great projects through the links on Patchwork Times. Have a wonderful week! I'm busy using my stash, but have nothing to change on my report from last week. I've been working on the Fur Ball donation and making flying geese for Kaktus. Soon I'll be able to change the numbers. TGIF even if it is the 13th! I've not been doing much sewing this week. DH has had some good programs on the television... I've also been helping Mom with a sewing project... Last night I made a yummy Scallop dinner and several sides that used up nearly all the pans in my cupboard. Took quite a while to clean up the kitchen afterwards. When I did get the opportunity pieces were cut for my part of the San Diego Humane Society's 26th Annual Fur Ball donation. I'm working on the paws block currently. 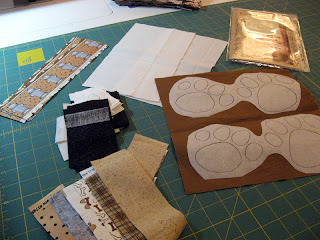 I will be cutting around the parts of the paws that are now attached to Steam A Seam Lite II and placing them on the white fabric, ironing them down, and with brown thread to match sewing down with a blanket stitch. Hope I don't get dizzy! I have been making progress on Kaktus which is a future 2012 UFO that has yet to be called by Judy at Patchwork Times. 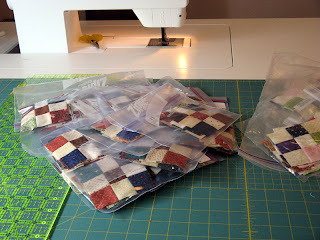 I didn't count to see where I am on the 622 flying geese units that are needed for the pattern, but I venture to say I'm about a quarter of the way there right now. Nothing on a "wall" but plenty on my sewing table. Since I have already finished my July UFO Challenge there is time to work on another that hasn't yet been selected. Kaktus will take some time to assemble because it has lots of flying geese units...622 in total. I decided to tackle them five at a time with the paper piecing technique. With just a few hours of sewing I have 80 of them done. The fabrics are mostly from a jelly roll, Wildflower Serenade by Kansas Troubles, gifted to me a couple of years back from my Mom. 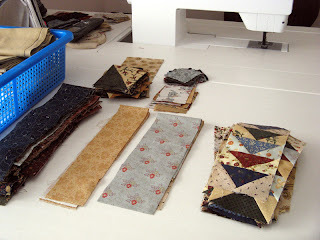 I did add a few neutral fabrics since the jelly roll didn't have many neutrals. I will need to find yardage for the beige that's pictured before too long so that I can include some of it in the flying geese. I am also working on my part of the San Diego Humane Society's 26th Annual Fur Ball donation that Kerry and I give them each year for their silent auction on event day. 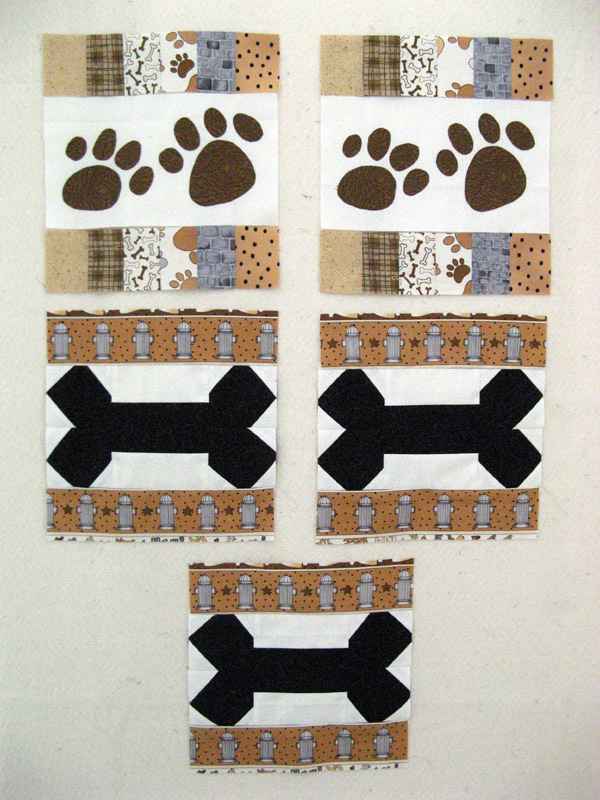 I'll be making the paw and bone blocks. 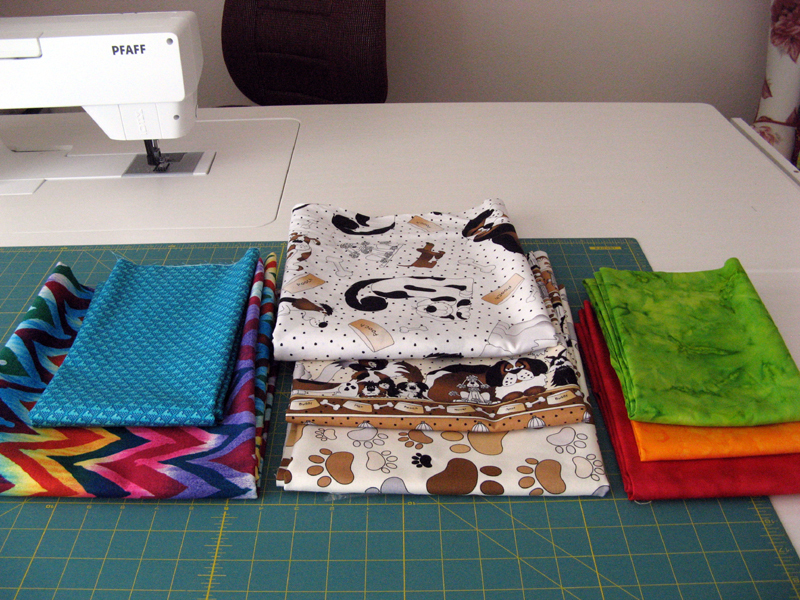 Pictured are the fabrics I'll be using. The event is August 25th; we'll be working to get this in their hands not later than the middle of August. The theme of the 26th Annual Gala is Polynesian Pawradise. 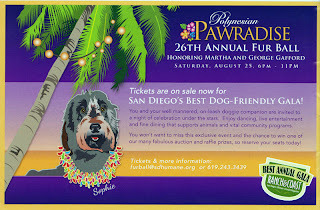 If you want more information you can contact them at furball@sdhumane.org. 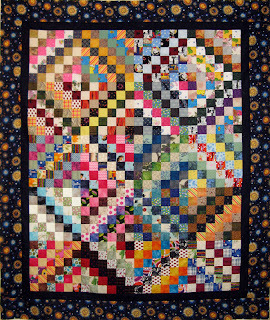 Kerry's Quilting surprised me yesterday with Kokonut No! done. I trimmed it down on Sunday. 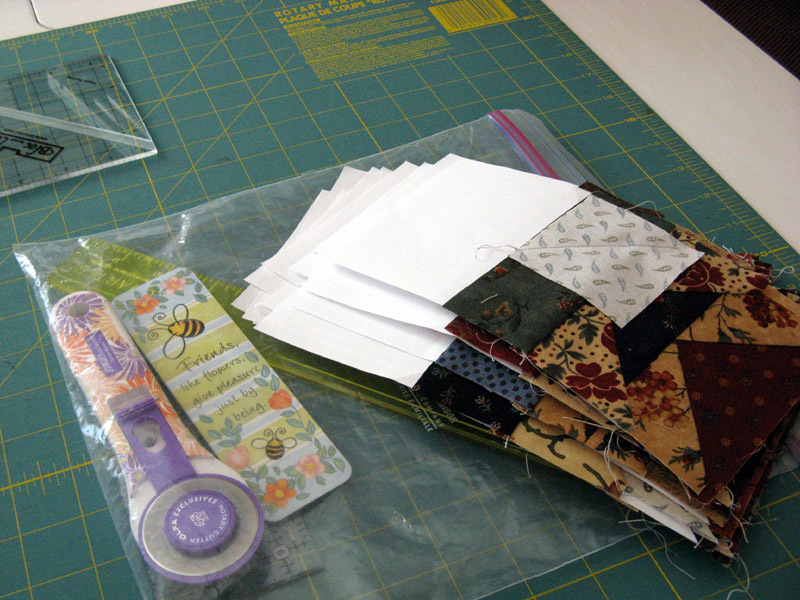 Next up binding, sleeve, and label preparation. Kokonut No! was my January UFO Challenge. All Crabapple Swap blocks are ready for pick up. 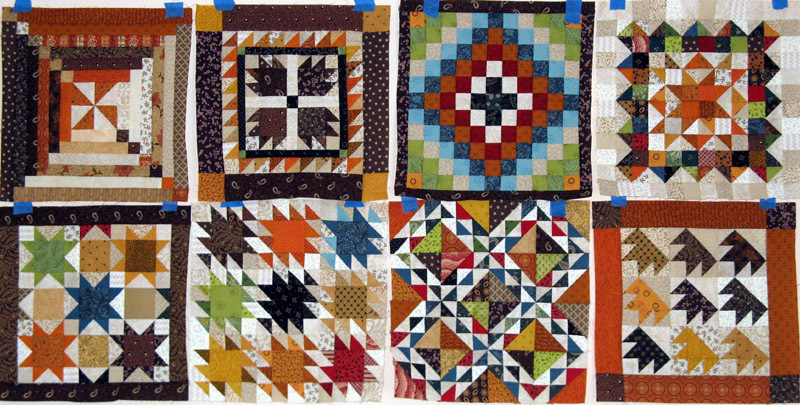 There is so much variety in the fabrics of the 9-patches. I think everyone will be as happy with their blocks as I am. 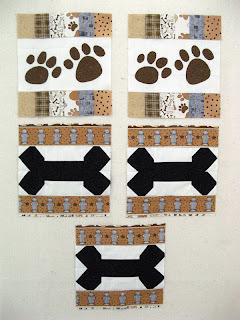 This project by Bonnie Hunter will be on my sewing table real soon. Glad that you found time to stop by. Love to hear what you think of my projects. There are lots of other projects going on around the globe. If you have time check some of the 100 or so that participate each week via Patchwork Times (link on my side bar). Labels: 2012 UFO, Design Wall, Fur Ball, Kaktus, Kokonut No! After looking everywhere for the black and white check I could have saved myself by a visit to Rosie's to start. Not just one but two different 1/4" checks to choose from so I got both. I also purchased enough of each to last me for another project or two in the future. I used the check on the bottom of the stack. I also found a good neutral multi colored confetti piece that will come in handy soon for another of my remaining 2012 UFOs. 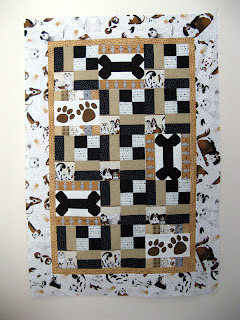 The dog bone piece will do well to add to the San Diego Humane Society quilt that Kerry and I will donate this year. I also got my prize this past week during a visit with Mary. Turns out I sold the most Sunshine Opportunity Quilt tickets this year. The "leftovers" made a great wall hanging that I'm happy to have. The fall theme I decorate my home with is scarecrows; this scarecrow will fit right in. This week I did make yet another purchase, but unlike last week I've got usage to record. Kontinental and Klowning were both finished along with the Hot Air Balloon top for my Mom. 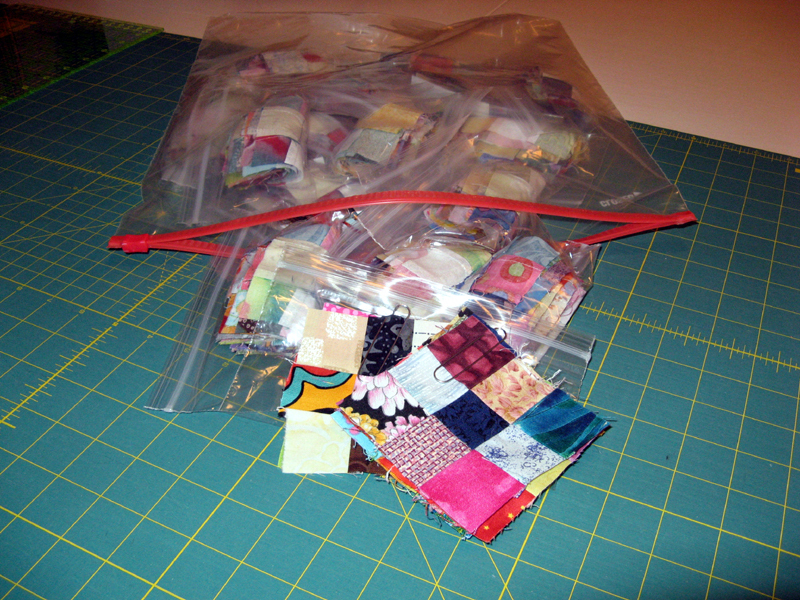 Other quilter's are using up there stash too. Check them out as well on Patchwork Times. I have my July UFO Challenge complete. 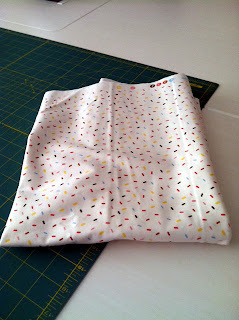 I hadn't originally planned to use the outer border fabric as I did. 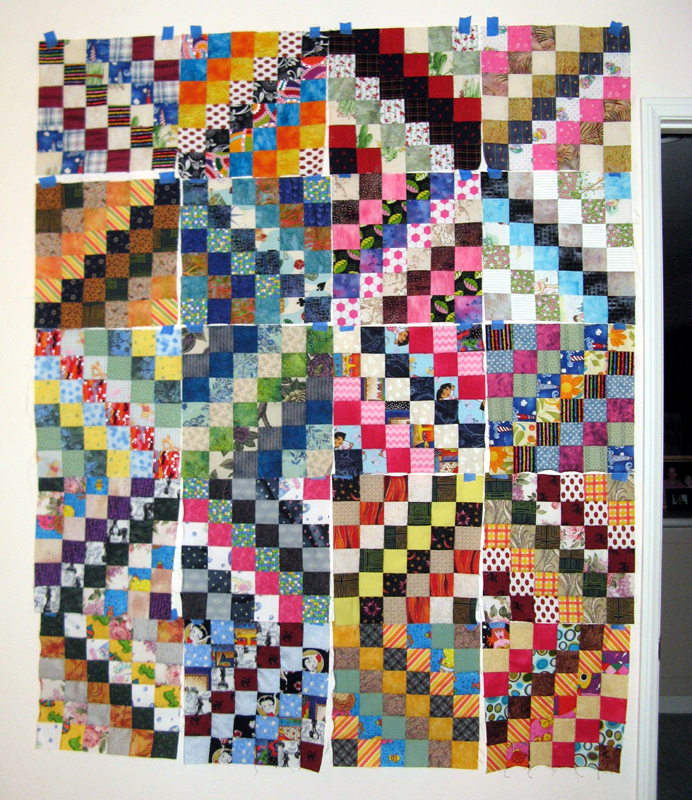 I purchased this way out fabric with the crazy zigzag running all through it in all the colors of the center blocks. I thought I might cut it the length of the fabric to present all the colors on every side. Then I stumbled on the look of it if I'd cut it on the width of the fabric instead. Having the purple nearest the purple corner squares in the sashing really looks striking in my opinion. The slight touch of yellow in the outside also adds a little punch. I did loose most of the pink using the zigzag as I did. 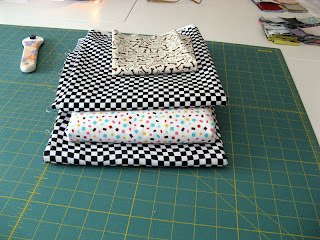 Thought I'd use the black multi dot for a binding, but now I'm leaning towards more yellow. Auditions will come after it's quilted. This pattern is called Little Monkey by Bonnie Hunter and can be found FREE on her website. I was busy yesterday putting the finishing touches on these two projects. 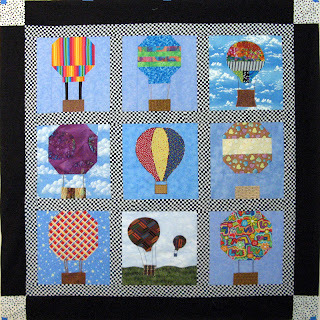 First up is the Hot Air Balloon top that is my Mom's. 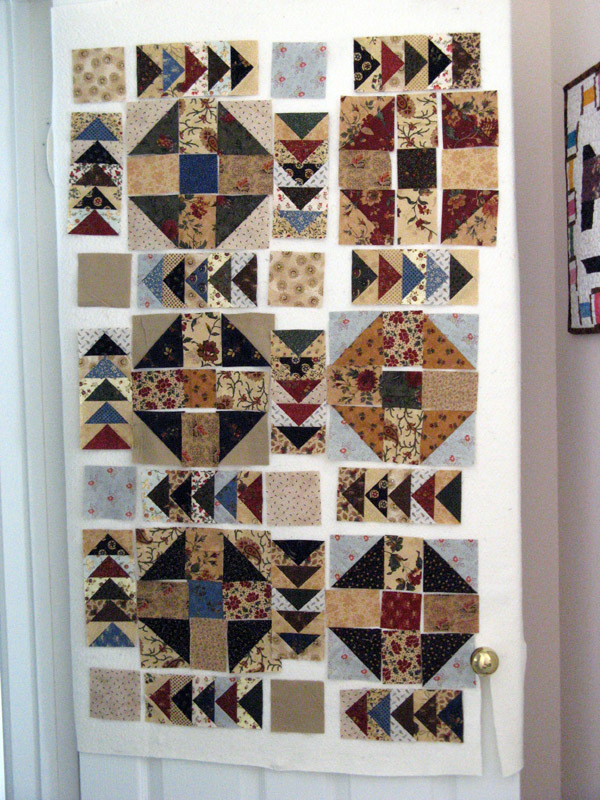 The blocks came from a swap she participated in a couple of years back. 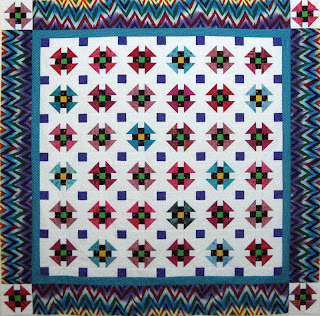 I don't know if the others who swapped found it has hard to find a fabric to sash the blocks with that would go along with all the different blue backgrounds that perplexed us. Once the decision was made to go for the black and white 1/4" check...it had to be found. Finding what you'd think to be a "staple" sort of fabric didn't turn out that way at all. 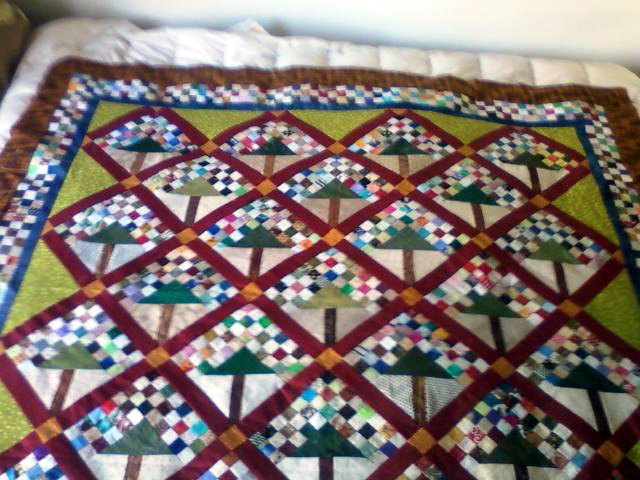 Finally found though and ready for quilting. I found putting the white with black dots in the corners gave it a a bit of a punch too. Three more blocks are left which will find their way onto the back. Over the course of the week I finished all 20 blocks, decided on an arrangement and then started assembly. Blue is a pleasing color for both gals and girls so navy became the inner border and scraps from a 2005 quilt were enough for the second border. I'm still working on a back for this project that I'm calling Kontinental. It is a pattern by Bonnie Hunter that is offered FREE on her website called Scrappy Trips Around The World. All Crabapple Swaps are in. I'll be sorting these into individual stacks on Wednesday. Should be ready for picking up in the next couple of days. Collette packaged her 9-patches different than anyone else; she grouped her lights and darks with paper clips and used snack size baggies. I'm looking forward to getting these to everyone. Too late Monday night to do any sewing after cleaning up from dinner. I'll have an extra sewing day on Wednesday with the holiday. We'll probably do like most and cook outdoors. My DH is excellent with the Weber and fireworks can be seen in several directions from our backyard. Not more than five miles away is a fireworks show that can be heard as well. Love the final minutes of the show! Today I've got Scrappy Trips Around The World on my wall. This is a FREE pattern by Bonnie Hunter that can be found on her website. 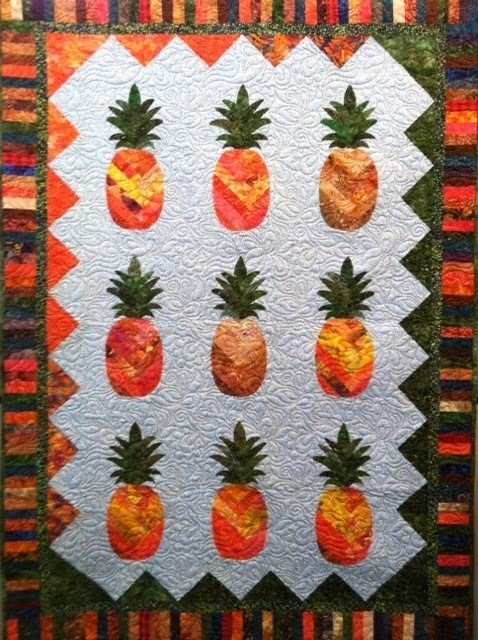 This project was started in January in a class hosted by Sunshine Quilt Guild held at Memory Lane. When the class was finished I had five blocks done and one started. 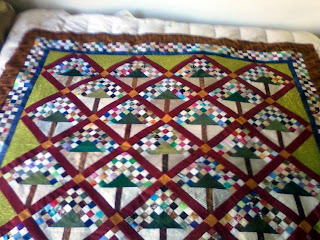 It is a very quick project using lots of 2 1/2" strips. I'll be calling my project Kontinental. Being ahead on my UFO this month gives me a chance to catch up on some other projects. I'll put an inner and a slightly larger outer border to finish it proper. Mary, Liz and Sue got done with their Crabapple Swaps over the weekend. I got these on Sunday. One last swap to get that should be tonight. It is my hope to separate everyone's set and get them out this week. Maybe someone is just waiting to work on their project this weekend. Check back in the coming weeks for pictures of completions. These are going to be really great. 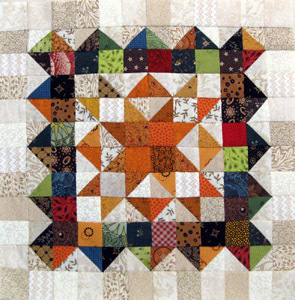 The Crabapple design is another of Bonnie Hunter's that can be found in her book Adventures with Leaders and Enders. Krabapple will be the name of my project...are you surprised? I was able to find the black and white check fabric I've been searching for during the past couple of weeks. You wouldn't think it would have been so difficult to find what I thought would be a "staple" type of fabric. Rosie's Calico Cupboard had two different 1/4" checks. One sort of wavy and the other straight. I purchased enough of both to last for awhile. I think I'll be using the wavy check as it appears to give movement to the balloons. This project of my Mom's will be next after Kontinental is assembled. Well you can see I've been adding to my stash this week. 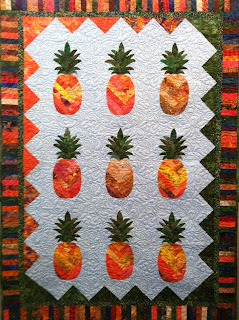 On Monday I went to Amidon Quiltworks in Poway. Sadly they will be closing their store front mid July. Nancy wants to try something different. The plan is to sell what remains of the fabrics online or on the road as she travels with the "show circuit". 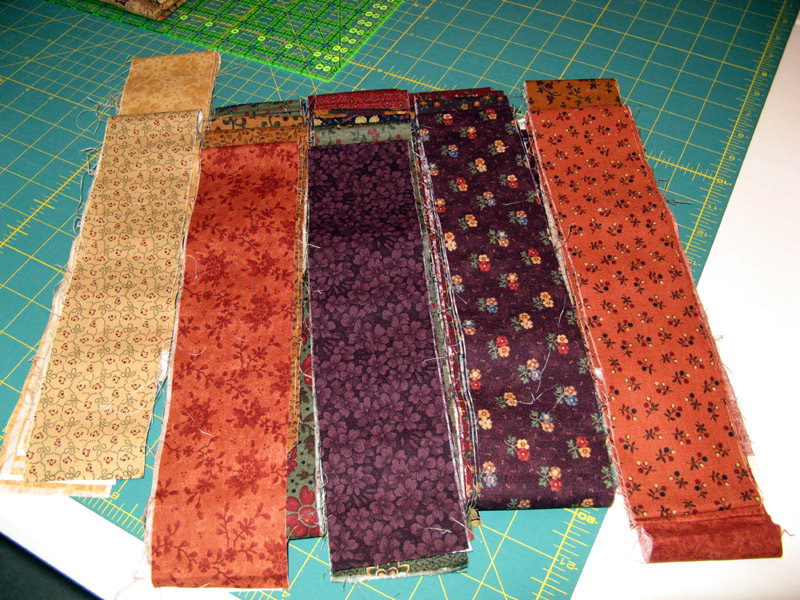 All of these fabrics should find homes this year. The ones on the left are neutrals for a UFO with Judy that hasn't yet been selected. The group in the middle will each go to different projects two not yet started and the other I'll use as a back for Knickels. 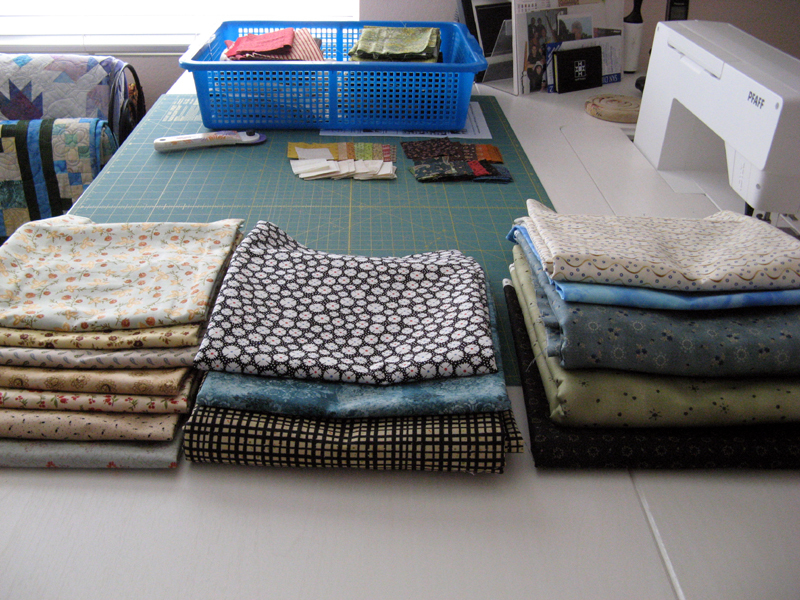 The largest stack on the right are for backs mostly with the two smaller pieces just because I thought they'd fill short falls in my stash. On Tuesday I went to Quilters Paradise. I couldn't find the black and white check, clown themed fabric, or a cute dog themed fabric that I was hunting. I did find this great confetti dot that was near the end of the bolt. You can see the rest came home with me =^.^=. 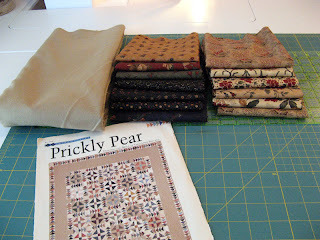 I've had this fabric before and loved it. Saturday I met up with Kerry for lunch. Afterwards we headed over to Quilters Choice which again sadly will be closing their store at the end of July. Kathy wants to retire and travel with her husband instead of being tied to a store. There are lots of fabrics available in her shop. All of these have projects to go into. The two groups in the center and left are part of what I've been hunting for. I resigned on the clown themed fabric and chose the wild zig zag print with the teal as the inner border that will complete my July UFO with Judy that I'm calling Klowning. 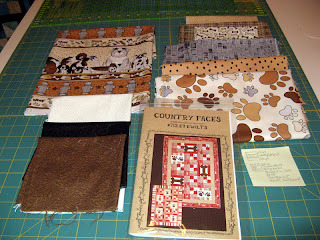 The fabrics in the middle are the dog themed fabrics for the San Diego Humane Society Fur Ball donation due end of August. The three on the right are for another UFO with Judy not yet selected. I'm not happy to record purchases, especially without recording a use...but sometimes it just has to be that way. I'll be sewing away with six more UFOs and who knows what else to bring the net to a figure I'm happy with before the end of the year. Stop by tomorrow and check out Klowning! Until then see how others used their stash this past week at Patchwork Times.